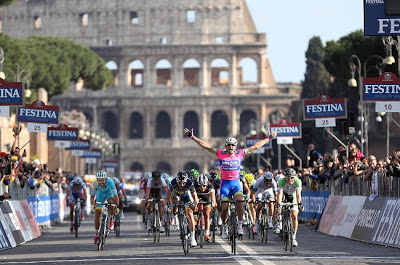 ITALIAN CYCLING JOURNAL: Roma Maxima, Pozzato: "My Soigneur Was Hiding"
Filippo Pozzato (Lampre-Merida) threw his arms up in victory as he crossed the finish line first in a sprint. "When I saw that my soigneur was hiding instead of celebrating, I knew there was something wrong", said Pozzato. What was wrong was that he hadn't won the race. With no race radios Pozzato had thought that everyone in the day's breakaway had been caught. But one rider had not been caught, Blel Kadri (Ag2r-La Mondiale) . A determined Kadri had managed to stay away for the last 40 km of the race despite a strong chase. The podium: Blel Kadri, (AG2R La Mondiale) 4:26:27, Filippo Pozzato (Lampre-Merida) at 0:00:37 and Grega Bole (Vacansoleil-DCM Pro Cycling Team) at same time.